On December 31, 2017, the Colts parted ways with head coach Chuck Pagano. After two interviews, it was widely reported that the Colts would hire New England Patriots' offensive coordinator Josh McDaniels to replace him, after McDaniels fulfilled his obligations to the Patriots in Super Bowl LII. The Colts announced on the team website that they had agreed to terms with McDaniels and scheduled a press conference with McDaniels for February 5, 2018. However, one day later, McDaniels unexpectedly withdrew from the agreement in principle to become the Colts' head coach. On February 11, 2018, after interviewing multiple candidates, including Leslie Frazier and Dan Campbell, the Colts announced the hiring of Frank Reich, formerly the Philadelphia Eagles' offensive coordinator. The Colts traded their first-round selection (3rd overall) to the Jets in exchange for the Jets' first-round selection (6th overall), two second-round selections (37th and 49th overall), and the their second-round selection in 2019. The Colts traded a second-round selection they received from the Jets (49th overall) to the Eagles in exchange for the Eagles' second-round selection (52nd overall) and fifth-round selection (169th overall). The Colts traded their third-round selection (67th overall) and their sixth-round selection (178th overall) to the Browns in exchange for the Browns' second-round selection (64th overall). The Colts traded their fifth-round selection (140th overall) to the Raiders in exchange for the Raiders' fifth-round selection (159th overall) and sixth-round selection (185th overall). The Colts traded defensive end Henry Anderson to the Jets in exchange for the Jets' seventh-round pick previously acquired from Seattle (235th overall). The Colts' 2018 schedule was announced on April 19. CIN – Randy Bullock 42-yard field goal, 8:20. Bengals 3–0. Drive: 10 plays, 69 yards, 4:50. IND – Adam Vinatieri 21-yard field goal, 1:23. Tied 3–3. Drive: 14 plays, 72 yards, 6:57. IND – Eric Ebron 26-yard pass from Andrew Luck (Adam Vinatieri kick), 12:02. Colts 10–3. Drive: 7 plays, 58 yards, 3:02. IND – Adam Vinatieri 38-yard field goal, 3:01. Colts 13–3. Drive: 12 plays, 58 yards, 6:23. CIN – John Ross 3-yard pass from Andy Dalton (Randy Bullock kick), 1:44. Colts 13–10. Drive, 5 plays, 75 yards, 1:17. IND – Adam Vinatieri 51-yard field goal, 0:02. Colts 16–10. Drive, 8 plays, 43 yards, 1:42. IND – T.Y. Hilton 5-yard pass from Andrew Luck (Adam Vinatieri kick), 8:13. Colts 23–10. Drive: 9 plays, 60 yards, 3:17. CIN – A.J. Green 38-yard pass from Andy Dalton (Randy Bullock kick), 4:09. Colts 23–17. Drive: 8 plays, 75 yards, 4:04. CIN – Joe Mixon 1-yard run (Randy Bullock kick), 11:07. Bengals 24–23. Drive: 7 plays, 55 yards, 4:05. CIN – Randy Bullock 39-yard field goal, 3:57. Bengals 27–23. Drive: 11 plays, 58 yards, 5:56. CIN – Clayton Fejedelem 83-yard fumble return (Randy Bullock kick), 0:24. Bengals 34–23. Drive: 13 plays, 58 yards, 3:33. IND – Eric Ebron 7-yard pass from Andrew Luck (Adam Vinatieri kick), 9:25. Colts 7–0. Drive: 11 plays, 75 yards, 5:35. WAS – Dustin Hopkins 49-yard field goal, 11:12. Colts 7–3. Drive: 5 plays, 27 yards, 1:57. IND – Nyheim Hines 8-yard run (Adam Vinatieri kick), 6:51. Colts 14–3. Drive: 8 plays, 75 yards, 4:21. WAS – Dustin Hopkins 27-yard field goal, 5:40. Colts 14–6. Drive: 7 plays, 20 yards, 3:37. WAS – Dustin Hopkins 49-yard field goal, 13:28. Colts 14–9. Drive: 11 plays, 42 yards, 6:07. IND – T.Y. Hilton 3-yard pass from Andrew Luck (Adam Vinatieri kick), 7:32. 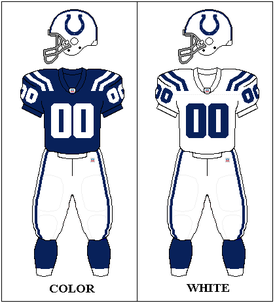 Colts 21–9. Drive: 13 plays, 75 yards, 5:56. PHI – Dallas Goedert 13-yard pass from Carson Wentz (Jake Elliott kick), 7:10. Eagles 7–0. Drive: 12 plays, 79 yards, 5:11. IND – Ryan Grant 5-yard pass from Andrew Luck (Adam Vinatieri kick), 0:24. Tied 7–7. Drive: 6 plays, 55 yards, 1:52. PHI – Jake Elliott 33-yard field goal, 3:05. Eagles 10–7. Drive: 11 plays, 75 yards, 6:40. IND – Adam Vinatieri 35-yard field goal, 9:41. Tied 10–10. Drive: 9 plays, 48 yards, 3:35. IND – Adam Vinatieri 31-yard field goal, 8:23. Colts 13–10. Drive: 4 plays, 4 yards, 1:07. PHI – Jake Elliott 24-yard field goal, 2:50. Tied 13–13. Drive: 13 plays, 75 yards, 5:33. IND – Adam Vinatieri 28-yard field goal, 14:20. Colts 16–13. Drive: 4 plays, 3 yards, 1:00. PHI – Wendell Smallwood 4-yard run (Jake Elliott kick), 3:02. Eagles 20–16. Drive: 17 plays, 75 yards, 11:18. IND – Zach Pascal 4-yard pass from Andrew Luck (Adam Vinatieri kick), 11:17. Colts 7–0. Drive: 7 plays, 75 yards, 3:43. HOU – Jadeveon Clowney fumble recovery in the end zone (Ka'imi Fairbairn kick), 5:19. Tied 7–7. HOU – Will Fuller 3-yard pass from Deshaun Watson (Ka'imi Fairbairn kick), 1:45. Texans 14–7. Drive: 5 plays, 52 yards, 1:27. HOU – DeAndre Hopkins 5-yard pass from Deshaun Watson (Ka'imi Fairbairn kick), 1:08. Texans 21–7. Drive: 2 plays, 8 yards, 0:39. IND – Adam Vinatieri 42-yard field goal, 0:02. Texans 21–10. Drive: 6 plays, 46 yards, 1:06. HOU – Deshaun Watson 5-yard run (Ka'imi Fairbairn kick), 6:39. Texans 28–10. Drive: 15 plays, 79 yards, 8:21. IND – Nyheim Hines 14-yard pass from Andrew Luck (Adam Vinatieri kick), 5:21. Texans 28–17. Drive: 5 plays, 75 yards, 1:25. IND – Eric Ebron 5-yard pass from Andrew Luck (two-point conversion failed), 7:41. Texans 28–23. Drive: 13 plays, 73 yards, 6:22. HOU – Ka'imi Fairbairn 40-yard field goal, 3:02. Texans 31–23. Drive: 10 plays, 54 yards, 4:39. IND – Nyheim Hines 9-yard pass from Andrew Luck (Luck pass to Rogers), 0:45. Tied 31–31. Drive: 9 plays, 85 yards, 2:13. IND – Adam Vinatieri 44-yard field goal, 6:00. Colts 34–31. Drive: 13 plays, 50 yards, 4:00. HOU – Ka'imi Fairbairn 29-yard field goal, 1:50. Tied 34–34. Drive: 12 plays, 59 yards, 4:10. HOU – Ka'imi Fairbairn 37-yard field goal, 0:00. Texans 37–34. Drive: 3 plays, 24 yards, 0:21. NYJ – Morris Claiborne 17-yard interception return (Jason Myers kick), 14:48. Jets 7–0. IND – Marcus Johnson 34-yard pass from Andrew Luck (Adam Vinatieri kick), 12:16. Tied 7–7. Drive: 5 plays, 75 yards, 2:32. NYJ – Jason Myers 30-yard field goal, 4:33. Jets 10–7. Drive: 13 plays, 69 yards, 7:43. IND – Adam Vinatieri 21-yard field goal, 13:25. Tied 10–10. Drive: 8 plays, 32 yards, 2:22. IND – Adam Vinatieri 31-yard field goal, 11:24. Colts 13–10. Drive: 6 plays, 28 yards, 1:51. NYJ – Terrelle Pryor 7-yard pass from Sam Darnold (Jason Myers kick), 2:32. Jets 17–13. Drive: 8 plays, 43 yards, 4:47. NYJ – Jason Myers 48-yard field goal, 1:25. Jets 20–13. Drive: 4 plays, -3 yards, 0:29. NYJ – Jason Myers 32-yard field goal, 0:00. Jets 23–13. Drive: 6 plays, 58 yards, 0:42. NYJ – Chris Herndon 32-yard pass from Sam Darnold (Jason Myers kick), 12:03. Jets 30–13. Drive: 5 plays, 72 yards, 2:57. IND – Eric Ebron 18-yard pass from Andrew Luck (Adam Vinatieri kick), 8:44. Jets 30–20. Drive: 6 plays, 75 yards, 3:19. NYJ – Jason Myers 37-yard field goal, 3:53. Jets 33–20. Drive: 9 plays, 56 yards, 4:51. IND – Erik Swoope 2-yard pass from Andrew Luck (Adam Vinatieri kick), 14:52. Jets 33–27. Drive: 13 plays, 75 yards, 4:01. NYJ – Jason Myers 45-yard field goal, 9:40. Jets 36–27. Drive: 10 plays, 48 yards, 5:12. NYJ – Jason Myers 37-yard field goal, 5:55. Jets 39–27. Drive: 4 plays, 6 yards, 2:04. NYJ – Jason Myers 45-yard field goal, 3:19. Jets 42–27. Drive: 6 plays, 4 yards, 1:58. IND – Chester Rogers 17-yard pass from Andrew Luck (Adam Vinatieri kick), 1:51. Jets 42–34. Drive: 8 plays, 63 yards, 1:28. IND – T. Y. Hilton 5-yard pass from Andrew Luck (Adam Vinatieri kick), 1:48. Colts 21–0. Drive: 9 plays, 82 yards, 5:35. IND – T. Y. Hilton 1-yard pass from Andrew Luck (Adam Vinatieri kick), 13:18. Colts 31–5. Drive: 3 plays, 2 yards, 1:31. IND – Mo Alie-Cox 26-yard pass from Andrew Luck (Adam Vinatieri kick), 8:21. Colts 7–0. Drive: 11 plays, 75 yards, 6:39. IND – Adam Vinatieri 26-yard field goal, 0:00. Colts 10–0. Drive: 13 plays, 70 yards, 7:17. OAK – Seth Roberts 31-yard pass from Derek Carr (Daniel Carlson kick), 11:56. Colts 10–7. Drive: 6 plays, 75 yards, 3:04. OAK – Jared Cook 25-yard pass from Derek Carr (Daniel Carlson kick), 6:13. Raiders 14–10. Drive: 7 plays, 79 yards, 4:28. IND – Adam Vinatieri 25-yard field goal, 0:26. Raiders 14–13. Drive: 16 plays, 68 yards, 5:47. OAK – Derek Carr 1-yard run (Daniel Carlson kick), 9:49. Raiders 21–13. Drive: 8 plays, 75 yards, 5:11. IND – Eric Ebron 20-yard pass from Andrew Luck (Andrew Luck-Chester Rogers pass), 7:39. Tied 21–21. Drive: 4 plays, 75 yards, 2:10. OAK – Brandon LaFell 6-yard pass from Derek Carr (Daniel Carlson kick), 1:01. Raiders 28–21. Drive: 11 plays, 75 yards, 6:38. IND – Marlon Mack 4-yard run (Adam Vinatieri kick), 10:47. Tied 28–28. Drive: 12 plays, 75 yards, 5:14. IND – Jack Doyle 10-yard pass from Andrew Luck (Adam Vinatieri kick), 5:28. Colts 35–28. Drive: 6 plays, 57 yards, 3:52. IND – Marlon Mack 1-yard run (Adam Vinatieri kick), 2:55. Colts 42–28. Drive: 5 plays, 27 yards, 2:21. IND – Eric Ebron 53-yard pass from Andrew Luck (Adam Vinatieri kick), 11:26. Colts 7–0. Drive: 7 plays, 75 yards, 3:34. JAX – Donte Moncrief 80-yard pass from Blake Bortles (Josh Lambo kick), 2:58. Tied 7–7. Drive: 5 plays, 97 yards, 2:42. IND – Eric Ebron 2-yard run (Adam Vinatieri kick), 0:00. Colts 14–7. Drive: 6 plays, 70 yards, 2:58. IND – Eric Ebron 12-yard pass from Andrew Luck (Adam Vinatieri kick), 9:19. Colts 21–7. Drive: 7 plays, 86 yards, 2:52. JAX – Leonard Fournette 1-yard run (kick failed, blocked), 5:53. Colts 21–13. Drive: 6 plays, 54 yards, 3:26. IND – Mo Alie-Cox 1-yard pass from Andrew Luck (Marlon Mack run succeeds), 1:46. Colts 29–13. Drive: 10 plays, 50 yards, 4:07. JAX – Josh Lambo 28-yard field goal, 0:05. Colts 29–16. Drive: 10 plays, 50 yards, 1:41. JAX – Leonard Fournette 1-yard pass from Blake Bortles (Josh Lambo kick), 6:25. Colts 29–23. Drive: 17 plays, 75 yards, 8:35. JAX – Josh Lambo 55-yard field goal, 4:03. Colts 29–26. Drive: 8 plays, 27 yards, 4:15. MIA – Kenyan Drake 33-yard pass from Ryan Tannehill (Jason Sanders kick), 12:22. Dolphins 7–0. Drive: 6 plays, 75 yards, 2:38. IND – Eric Ebron 14-yard pass from Andrew Luck (Adam Vinatieri kick), 9:37. Tied 7–7. Drive: 5 plays, 75 yards, 2:45. IND – Jack Doyle 1-yard pass from Andrew Luck (Adam Vinatieri kick), 1:44. Colts 14–7. Drive: 13 plays, 73 yards, 5:49. MIA – Leonte Carroo 74-yard pass from Ryan Tannehill (Jason Sanders kick), 1:00. Tied 14–14. Drive: 2 plays, 75 yards, 0:44. MIA – Jason Sanders 29-yard field goal, 9:14. Dolphins 17–14. Drive: 8 plays, 31 yards, 4:18. MIA – Kenyan Drake 14-yard rush (Jason Sanders kick), 13:36. Dolphins 24–14. Drive: 9 plays, 62 yards, 4:55. IND – Adam Vinatieri 46-yard field goal, 8:26. Dolphins 24–17. Drive: 10 plays, 47 yards, 5:10. IND – Eric Ebron 12-yard pass from Andrew Luck (Adam Vinatieri kick), 4:25. Tied 24–24. Drive: 7 plays, 89 yards, 3:18. IND – Adam Vinatieri 32-yard field goal, 0:00. Colts 27–24. Drive: 7 plays, 44 yards, 2:38. JAX – Josh Lambo 30-yard field goal, 2:03. Jaguars 3–0. Drive: 13 plays, 43 yards, 6:49. JAX – Josh Lambo 37-yard field goal, 11:42. Jaguars 6–0. Drive: 10 plays, 49 yards, 5:48. HOU – Alfred Blue 3-yard run (Ka'imi Fairbairn kick), 2:26. Texans 7–0. Drive: 10 plays, 82 yards, 4:09. IND – Marlon Mack 4-yard run (Adam Vinatieri kick), 6:33. Tied 7–7. Drive: 2 plays, 64 yards, 0:46. IND – Eric Ebron 14-yard pass from Andrew Luck (Adam Vinatieri kick), 2:57. Colts 14–7. Drive: 5 plays, 66 yards, 2:16. IND – Adam Vinatieri 54-yard field goal, 0:04. Colts 17–7. Drive: 10 plays, 53 yards, 1:14. HOU – Lamar Miller 1-yard run (Ka'imi Fairbairn kick), 7:38. Colts 17–14. Drive: 16 plays, 75 yards, 7:22. IND – Zach Pascal 12-yard pass from Andrew Luck (Adam Vinatieri kick), 3:51. Colts 24–14. Drive: 8 plays, 75 yards, 3:47. HOU – DeAndre Hopkins 7-yard pass from Deshaun Watson (Ka'imi Fairbairn kick), 2:37. Colts 24–21. Drive: 6 plays, 70 yards, 1:53. NYG – Saquon Barkley 1-yard rush (Aldrick Rosas kick), 8:11. Giants 7–0. Drive: 11 plays, 45 yards, 5:54. NYG – Scott Simonson 3-yard pass from Eli Manning (Aldrick Rosas kick), 1:41. Giants 14–0. Drive: 9 plays, 87 yards, 4:29. IND – Nyheim Hines 1-yard rush (Adam Vinatieri kick), 4:09. Giants 14–7. Drive: 12 plays, 78 yards, 6:48. NYG – Aldrick Rosas 40-yard field goal, 1:10. Giants 17–7. Drive: 9 plays, 53 yards, 2:59. IND – Dontrelle Inman 2-yard pass from Andrew Luck (Adam Vinatieri kick), 7:38. Giants 17–14. Drive: 7 plays, 85 yards, 4:11. NYG – Eli Manning 1-yard rush (Aldrick Rosas kick), 3:42. Giants 24–14. Drive: 8 plays, 85 yards, 3:56. IND – Marlon Mack 3-yard rush (Adam Vinatieri kick), 0:32. Giants 24–21. Drive: 7 plays, 74 yards, 3:10. NYG – Aldrick Rosas 27-yard field goal, 9:20. Giants 27–21. Drive: 12 plays, 66 yards, 6:12. IND – Chester Rogers 1-yard pass from Andrew Luck (Adam Vinatieri kick), 0:55. Colts 28–27. Drive: 8 plays, 53 yards, 2:48. IND – Eric Ebron 6-yard pass from Andrew Luck (Adam Vinatieri kick), 10:37. Colts 7–0. Drive: 9 plays, 75 yards, 4:28. IND – Marlon Mack 2-yard run (Adam Vinatieri kick), 4:08. Colts 14–0. Drive: 9 plays, 74 yards, 5:25. IND – Dontrelle Inman 18-yard pass from Andrew Luck (Adam Vinatieri kick), 6:29. Colts 21–0. Drive: 7 plays, 65 yards, 3:23. HOU – Keke Coutee 6-yard pass from Deshaun Watson (Ka'imi Fairbairn kick), 11:03. Colts 21–7. Drive: 16 plays, 89 yards, 6:13. ^ "Report: Colts to hire Pats OC Josh McDaniels as coach". ^ "Will There Be Any Legal Fallout for Josh McDaniels, Colts?". ^ "Josh McDaniels withdraws from Colts coaching job". ^ "Indianapolis Colts on Twitter".